In Mark 11:15-18, we see Jesus driving out the traders doing business in the temple. He overturned their tables and chairs and chased them out! We always have in mind Jesus as being calm and peaceful. 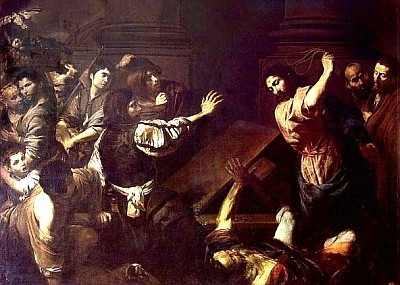 Have you ever wondered what made Jesus so furious and angry on this occasion? Obviously, the unscrupulous traders were doing business in the grounds of the holy Temple and desecrating it. Not only that, these traders were cheating the poor. Jesus told them to stop making His House a den of thieves. That was not all. There was something else that upset Jesus. The traders were doing business in the area of the temple known as the “outer court”. This was area where the Gentiles could come to pray! It wasn’t just commercial desecration of the holy temple. It was hindering Gentiles from praying to God! And this made Jesus very angry. It was for Jews AND Gentiles. All nations. Jesus, the Jew, was defending the Gentiles access to prayer in the temple and denounced the Jewish traders under the patronage of the Jewish priests! That was a dangerous thing to do. Not only was he disrupting their business activities but He was also FAVORING the Gentiles over the Jews!